Australian stationery chain Smiggle makes its way to Singapore shores and Tan DingXiang is the first to catch it on its Asian debut. The name ‘Smiggle’ reminds one of a small, cute, cuddly and furry animal. However, the company associated with that name is anything but an animal. Neither is it small, for it is Australia’s most sought-after stationery brand, with 99 stores opened in Australia and New Zealand. And what better way to mark its break into the fray in the Asian market, with its 100th store opening in Singapore? Opened since Apr 29 at Plaza Singapura, the 83-square-metre store, although small, boasts a wide variety of novelty designs that make plain old stationery fun again. One unique point to note is its interesting way of product classification – colours. Appealing to customers’ sense of sight, colour-coding makes one’s shopping experience an easy and delightful experience, as it reduces the hassle of having to pick out what one wants in a myriad of colours. From blue to pink and even purple, colour-coding its products makes shoppers' experience at Smiggles hassle-free. 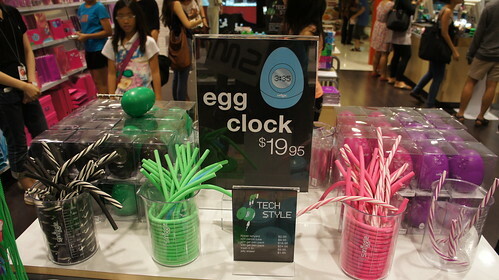 Colour is not the only unique selling point of Smiggle’s products, as we found. The shapes of the products also appealed to us. Our perception of the boring eraser was transformed when we were given one in the shape of a sheep. “Take a sniff,” the store keeper directed. We did. To our delight, the eraser was scented with a faint but pleasing smell of strawberry. “Each eraser’s colour corresponds to its scent,” she continued. Green ones emitted apple flavour, while the purple ones smelled just like the source of Australian wine – grapes. Stored in beakers, these cute erasers are on sale for $1.50 a piece. But if you thought Smiggle peddles stationery alone, think again. The company, which started in 2003, has also taken steps to cater to the needs of its tech-savvy customers. Enclosed in the shape of a bird’s ova was the Egg Clock. Going at $19.95 per set, the clock acts just like any other desktop organiser, telling the time, temperature and acting as an alarm. So what’s the catch behind this gadget? “It’s more compact and more aesthetically appealing”, said our store keeper. That was not all. 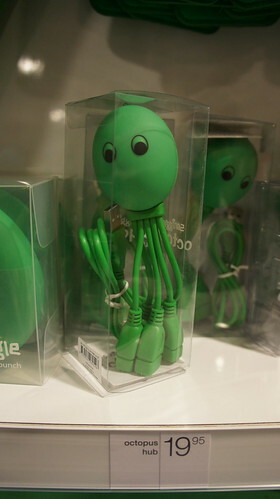 We were intrigued by a particular gadget called the ‘Octopus Hub’. What kind of gadget could that be? We later found out that the Octopus Hub was a product true to its namesake, as on the end of its ‘tentacles’ were USB jacks – it was a USB hub. Colour junkies will be delighted to know that it comes in green, blue and even pink. 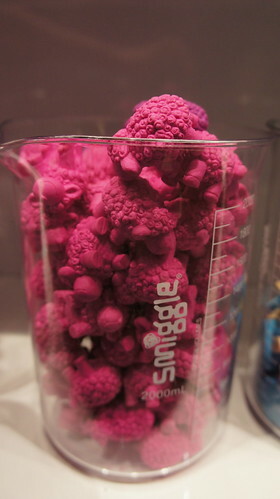 To appeal to children, Smiggle even has its Fuzzy Rascals range of products. These Rascals are shown in the form of furry critters and can be found at the Fuzzy Rascals corner in the store. There, ‘lollipop’ erasers on sticks, known as Yum Yum Erasers, took the shape of these little monsters. That is not all. These characters even adorn notebooks, pencil cases and exercise books, making studying a slightly more fun experience for kids. And with a new store slated to open at Lot 1 Shoppers’ Mall in Chua Chu Kang, thing will, in time, look to be a bash for Smiggle in the Asian market. Smiggle is located at #B1-02, Plaza Singapura, along 68 Orchard Road. All inquiries can be made at 6338 5782.